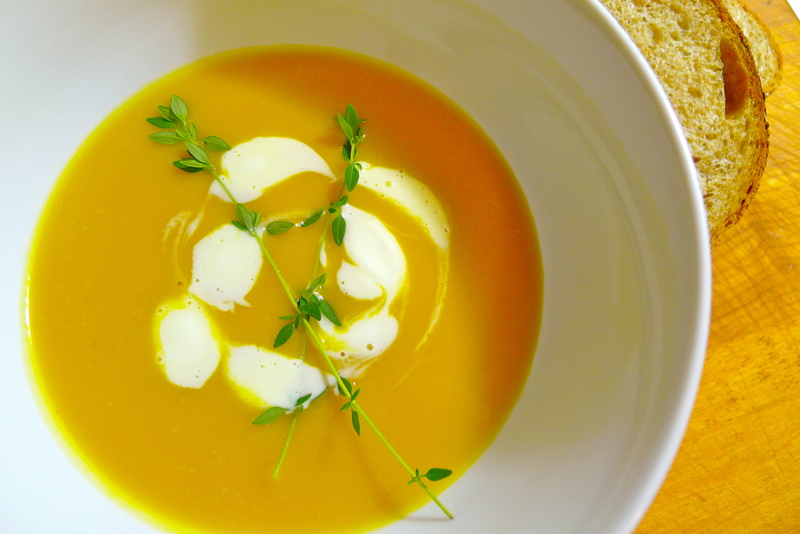 This is a neat little twist on butternut squash soup. Roasting the squash concentrates its flavor. Roasting it in a buttery syrup accented with balsamic vinegar adds a little bit of bite, and a whole lot of interest. 2. In a small saucepan, heat the butter and the olive oil together over very gentle heat. When the butter has melted, add the brown sugar, balsamic vinegar, cayenne pepper and salt. Stir everything together until everything is well-incorporated. Continue to heat everything for a minute or two more. The mixture will become syrupy, and the harshness of the vinegar will soften a little bit. 3. In a large bowl, toss the butternut squash and the butter mixture together. Spread the squash out evenly on a parchment paper-lined cookie sheet. Roast the squash until it is tender, about 15-20 minutes. When the squash is done, transfer it from the hot pan to a bowl. 4. Heat some olive oil in a large casserole or Dutch oven over medium heat. When the oil starts to shimmer, add the shallots. Sauté them until they begin to soften. Add the apples to the shallots, and heat them together for about a minute or two. Add the butternut squash, and stir everything together. Add the chicken stock and the apple cider. Let everything simmer for about 20 minutes, skimming any foam that rises to the surface. 5. When the apples are tender, blend everything together with an immersion blender until smooth. Adjust the seasoning. Add the maple syrup and heavy cream. Stir everything together, and adjust the seasoning for a final time. Garnish with a dollop of crème fraîche and serve. Such wonderfully complementary flavors here. Your soup sounds just wonderful. So pretty! I bet this would be pretty terrific with sherry vinegar too. For some reason sherry vinegar and shallots just go together in my head. Ooooh! Sherry vinegar! I gotta’ try that next. I love me an immersion blender. I don’t know what I would do without it. You should totally get one. They’re not that expensive (a perfectly serviceable one can be had for about $30), and they make puréed soups a breeze. Also could probably be used for baby food, Mama Bear!